One year ago, I opened my shop and launched my shop website under its new name: Ms. Peach Plus Designs. My best ideas often come in the middle of the night, and the idea of a stationery shop came and stayed with me. Two years into it, I knew that my vision was not aligning with what I was doing. I took a step back, prayed, and listened to what I felt God was telling me to do. This first year has been interesting to say the least. I spent time in the comparison game. (Yeah, totally not worth it.) I also spent time learning, reading, and learning more. Before long, I realized that I came into this with the right idea, but the wrong path to make it happen. I was all about the hustle, but I soon realized that while hustling, I was not alive in my life. My epiphany really hit last month. I pretty much shut down everything and began listening for God’s voice in my day. 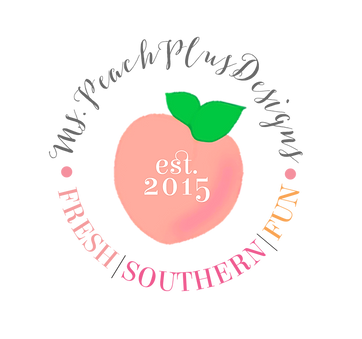 Thinking about what I want to do and create, led me to what the Ms. Peach Plus brand is becoming now. It is more of a reflection of what I intended in the beginning. I just took the scenic route to finding my best way to express it. What I am aiming to achieve with my blog and shop is a great sense of authenticity, inspiration, and growth. I’m still learning how to best make things work, but what I have accepted the beauty of today. MPPD has helped me to achieve that. What is MPPD about? The same as always: fresh design, southern spirit, and fun times. This first year has been both amazingly difficult and amazingly wonderful. I have gained a great deal of insight, and I am excited to continue to share what I have learned with you all through my craft.